I am a truly magnificent creature with an incredibly keen sense of hearing and exceptional eyesight. If I don't come when you call me, I'm just ignoring you. I'm kidding, really. I am very obedient as well as intelligent. 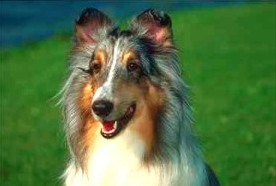 You might have seen me on that famous American series "Lassie". That wasn't exactly ME, but it could have been. The stars of that show were relatives of mine. I have a beautiful coat, but it requires regular brushing to keep it looking smooth and tangle-free. When fully grown, I am between 20 and 25 1/2 inches tall (50.8 to 6380.5 centimeters) and I weigh between 40 and 75 pounds (18 to 33.8 kilograms). We have no Collie-Rough Breeders listed at this time. Click here to place your Collie-Rough Ad!